The investigation includes fungal meningitis (a form of meningitis that is not contagious), localized spinal or paraspinal infections, such as epidural abscess and arachnoiditis, and infections associated with injections in a peripheral joint space, such as a knee, shoulder, or ankle. The predominant fungus identified in patients is Exserohilum rostratum. 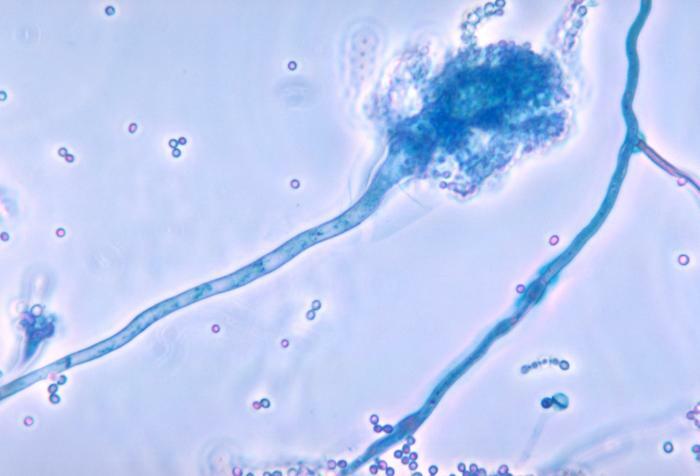 One patient, the index case, had a laboratory-confirmed Aspergillus fumigatus infection. These fungi are common in the environment, however fungal infections are not transmitted from person to person. On October 6, 2012 NECC voluntarily recalled all products compounded at and distributed from its facility in Framingham, Massachusetts. CDC Information About Additional Medical Products (non-MPA) From New England Compounding Center. On October 31, 2012 The U.S. Food and Drug Administration announced that Ameridose, LLC, based in Westborough, Mass., voluntarily recalled all of its unexpired products in circulation. FDA Information on the recall of all Ameridose products. On September 26, 2012, NECC voluntarily recalled three lots of preservative-free MPA associated with the multistate outbreak of fungal meningitis and other infections. On October 6, NECC expanded its recall to include all products in circulation that were distributed from its facility in Framingham, Massachusetts. On October 11, 2012 FDA released a MedWatch Alert stating that samples of injectable betamethasone and cardioplegia solution tested positive for bacterial contamination. The FDA and CDC laboratories have identified bacteria and/or fungi present in NECC-supplied preservative-free injectable betamethasone, preservative-free triamcinolone, and cardioplegia solution (specific lots listed below). FDA released a MedWatch Safety Alert on October 15 stating that the sterility of any injectable drugs, including ophthalmic drugs that are injectable or used in conjunction with eye surgery, and cardioplegia solutions produced by NECC is of significant concern. The available epidemiological and laboratory data do not, support evidence of an outbreak of infections linked to usage of non-methylprednisolone NECC products. If you have taken or used any medication from NECC and feel sick, you should seek medical attention. Any infections potentially related to NECC products should be reported to FDA’s MedWatch and to your state health department. CDC and FDA identified bacterial and/or fungal contamination in unopened vials of betamethasone, cardioplegia, and triamcinolone solutions distributed and recalled from NECC. These include bacteria known as Bacillus, and fungal species including Aspergillus tubingensis, Aspergillus fumigatus, Cladosporium species, and Penicillium species. Although rare, some of the identified Bacillus species can cause disease in humans. Some of the fungal organisms identified, particularly Aspergillus fumigatus, are also known to cause disease in humans. It is not known how product contamination with these organisms could affect patients clinically. See CDC’s Advice for Clinicians below. 08152012@84 Penicillium sp., Cladosporium sp. 08172012@60 Aspergillus tubingensis, Penicillium sp. FDA released a MedWatch Safety Alert on October 15 stating that the sterility of any injectable drugs, including ophthalmic drugs that are injectable or used in conjunction with eye surgery, and cardioplegia solutions produced by NECC is of significant concern. FDA advised healthcare providers to follow-up with patients who were administered any of these products purchased from or distributed by NECC on or after May 21, 2012. CDC recommends that clinicians remain vigilant for the possibility that infections may have resulted from injection of NECC products, and that routine laboratory and microbiologic tests, including bacterial and fungal cultures, should be obtained as necessary by treating clinicians. There has been no prior regular surveillance for adverse events following epidural steroid injections; however, infection is a known, although likely rare, risk that has been documented in the medical literature. Although CDC has received reports of illness in patients who have received the medications listed in the table above, including some patients who had evidence of meningeal inflammation, CDC and public health officials have no reports of laboratory-confirmed bacterial or fungal meningitis, spinal, or paraspinal infections caused by these products. The available epidemiological and laboratory data do not, at this time, support evidence of an outbreak of infections linked to usage of non-methylprednisolone NECC products. However, because it is possible that some of the organisms listed in the table above can cause human disease, clinicians should continue to include bacterial and/or fungal infection in the differential diagnosis when evaluating symptomatic patients who were exposed to these medications, including consideration of empiric anti-bacterial and/or antifungal therapy. Consultation with an infectious disease specialist is strongly encouraged to help make diagnosis and treatment decisions in these cases. If the evaluation of these patients is suggestive of fungal infection, please consult existing CDC treatment guidance associated with this outbreak. Physicians should continue to report infections potentially related to NECC products to FDA’s MedWatch and to state health departments.